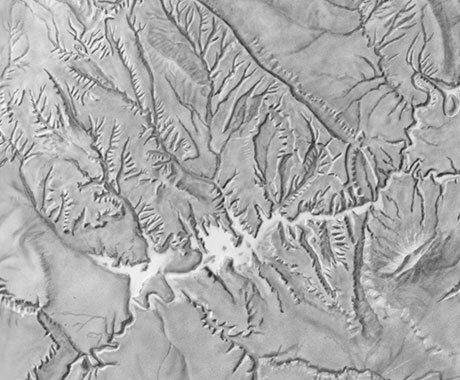 Bill von Allmen (1928–2013) was a shaded-relief artist with the US National Park Service (NPS), Harpers Ferry Center. In 1974, he trained for six weeks under Paul Witzler at the Swiss Federal Office of Topography (swisstopo). 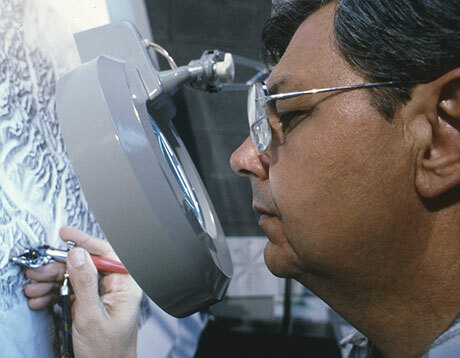 During his 22 years with the NPS, von Allmen produced reliefs for over 80 park maps, working primarily with a Paasche AB airbrush. He applied highlights and shadow touchups with a small paintbrush. Bill von Allmen excelled at depicting the cliffs and canyons of the southwestern US, such as the example below of Glen Canyon National Recreation Area, Utah. Relief of the Glen Canyon Recreation Area (section Lake Powell), 1986. Source: US National Park Service, Bill von Allmen. Bill von Allmen at work.